Just before writing this, I took a look at director Ron Howard’s filmography and realized that, while I’ve seen most of his movies, I’ve only really liked a few: I guess my favorites would be Parenthood (1989) and Apollo 13 (1995), with The Missing (2003) and Frost/Nixon (2008) coming behind. Yeah, yeah, I know what you’ll say: He also has the 80’s trifecta of Splash (1984), Cocoon (1985), and Gung Ho (1986) to his credit – I admit they’re all fine and entertaining. But they’re not that memorable. And the films I haven’t enjoyed at all – Backdraft (1991), Ransom (1996), A Beautiful Mind (2001), The Da Vinci Code (2006), Angels and Demons (2009) – are all examples of lazy, by-the-numbers filmmaking. In any case, last year I was in a hotel in Bogotá and Rush was playing on the TV, so I gave it a half-hearted go… and to my surprise I was hooked for a good twenty minutes. 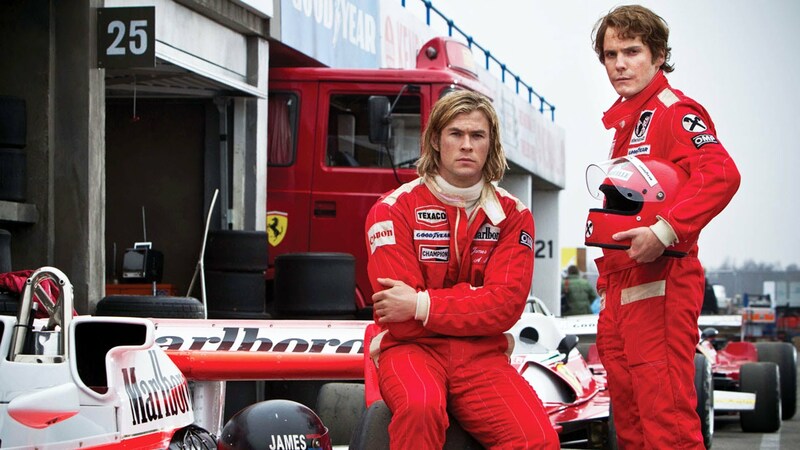 I went to sleep but immediately added it to the never-ending list of films I needed to watch, if only to see how the real-life love/hate relationship between Formula 1 racers James Hunt (Chris Hemsworth) and Niki Lauda (Daniel Brühl) would play out. And now that I’ve seen the whole thing, it’s right up there with Howard’s best. Rush is a prime example of how big-budget Hollywood filmmaking can work. None of it is particularly realistic – from the extreme close-ups to the amped-up color palette and simplistic character motivations, it is obvious that Howard is taking a cue from the style of other over-caffeinated directors like Michael Bay and Tony Scott. But he pulls it off: The race scenes are spectacular, with detailed shots enhanced by visual effects that make you feel as if you’re part of the action. And he never lets the pyrotechnics overpower the drama of Hunt and Lauda’s rivalry, two men whose happiness wholly depended on speed (Hunt died in 1993, but Lauda is still active, most recently as a chairman for the Mercedes Formula 1 team). Rush may not be the deepest of biographical films, and once again for Howard, not that memorable. But it is one fun ride.